Refer to “transmission removal” and “transmission installation” . Organize the parts in their respective groups (i.E., Drive or driven) so that they can be reinstalled in their original positions. Disassemble the countershaft as shown in the transmission construction. Refer to “transmission construction” . 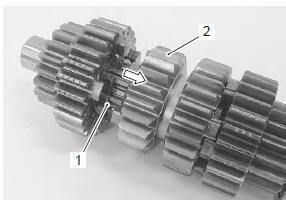 remove the 6th drive gear snap ring (1) from its groove and slide it towards the 3rd/4th drive gears (2). 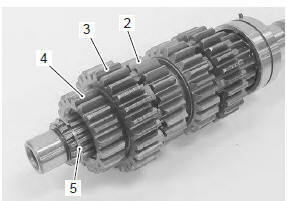 Slide the 6th (3) and 2nd (4) drive gears toward the 3rd/4th drive gears (2), then remove the 2nd drive gear circlip (5). Remove the 2nd drive gear (4) and 6th drive gear (3). Remove the countershaft bearing (6) using hydraulic press. 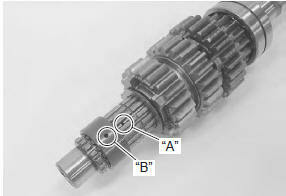 Disassembly the driveshaft as shown in the transmission construction. Refer to “transmission construction” . when reassembling the transmission gears, attention must be given to the locations and positions of washers and snap rings. 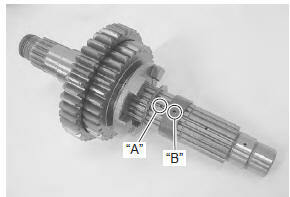 The cross sectional view shows the correct position of the gears, bushings, washers and snap rings. Refer to “transmission construction” . never reuse a snap ring. After a snap ring has been removed from the shaft, it should be discarded and a new snap ring must be installed. When installing a new snap ring, do not expand the end gap larger than required to slip the snap ring over the shaft. After installing a snap ring, make sure that it is completely seated in the groove and securely fitted. rotate the bearing by hand to inspect if there is any abnormal noise and for smooth rotation. Replace the bearing if there is anything unusual. Before installing the gears, apply engine oil to the driveshaft and countershaft. Before installing the oil seal, apply grease to the oil seal lip. When installing a new snap ring (1), pay attention to its direction. Fit it to the side where the thrust is as shown in the figure. When installing the gear bushings onto the driveshaft, align the shaft oil holes “a” with the bushing oil hole “b”. 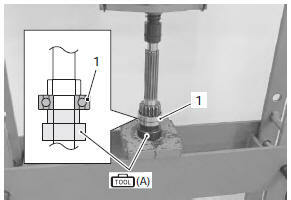 Install the countershaft bearing (1) using a hydraulic press and special tool. 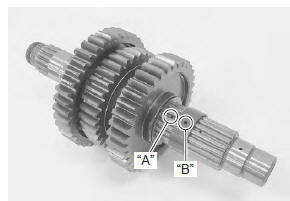 When installing the gear bushing onto the countershaft, align the shaft oil hole “a” with the bushing oil hole “b”.